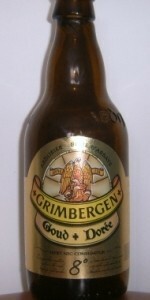 The best grimbergen i've had. Pale golden colour (a bit too pale for golden to be honest) with an excellent fluffy head of foam. Smell of malt, yeast and alcohol. Interesting taste of dried fruits (fig? ), which has a nice synergy with the fusel flavour. The wheat and alcohol ensure a smooth and warming mouth feel, similar to a Weizenbock. Mild bitterness in the aftertaste that lingers well. Good belgian blond. Pale yellow golden color with lots of thick head with medium retention, but leaving heavy laces. Unexpected sour aroma with lemony notes, hints of pineapple, green apples and wheat. Interesting that its flavor is a bit different than its nose, especially on the sourness intensity. Taste of peppery yeast, wheat, Cointreau liquor, peaches and brown sugar. A hint of tart, especially in its head. Mildly dry finish. Light to medium body with an effervescent carbonation. 8% ABV is well hidden. Not a highlight among its style and country, but still a good beer and worth it to try.